It appears that we’re going to end October just a quarter of an inch short of the rainfall record for the month; yesterday we received another half inch or so of rain. Finally, though, the forecast for the next ten days predicts more sunny and dry days than cloudy and rainy, and we might even see temperatures above 50 degrees Fahrenheit on several days. This past Monday and Tuesday saw high temperatures approaching 60 degrees Fahrenheit, a brief reprieve from the cool, rainy weather we’ve been experiencing for most of the month. Such warm, mid-fall days are termed “Indian Summers,” although generally these warm periods tend to last for more than a couple days. Another characteristic of Indian Summers is the hordes of Asian ladybird beetles and boxelder beetles that can be seen flying about and covering south-facing windows. These bugs can be found throughout the spring, summer, and fall in small numbers, but on warm fall days they tend to congregate and disperse to new locations in search of overwintering sites (such as your house). Earlier this week it was difficult to walk outside without having these two species land on some part of your body. 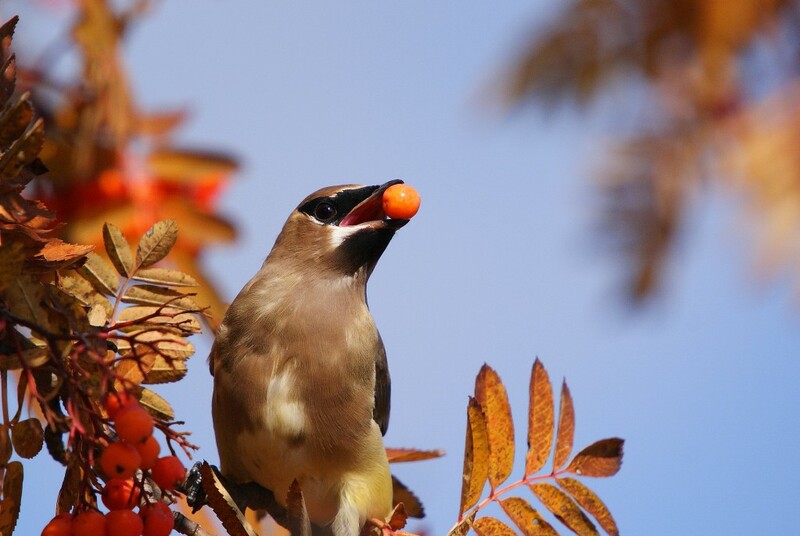 Cedar Waxwing feeding on European mountain-ash berries west of Interpretive Center, 10/26/09.